BELLA - Taste the Beauty! : BELLA knows Bounty! Dandy and I were just hanging out in the sun on the back porch when Gail called to tell me that she'd opened her latest issue of Sunset magazine to discover the Oregon Bounty map which artistically illustrates the cool foodie things to do around the state. 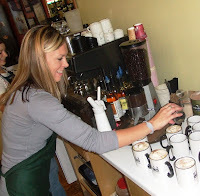 "the thing to sip in eastern Oregon" for the Oregon Bounty Wanderfeast! 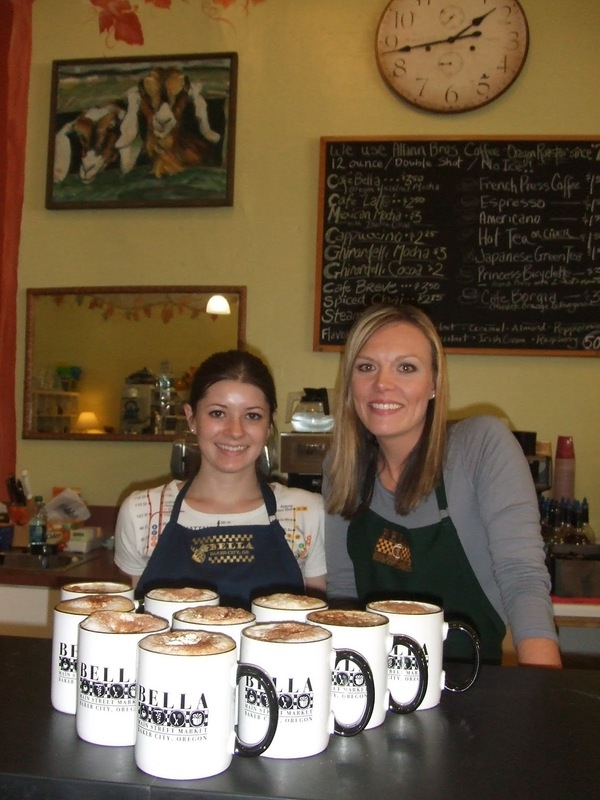 The Cafe' BELLA, a completely satisfying experience in a cup combines the deliciousness of Espresso Italiano from Allann Brothers Coffee, real Oregon Hazelnut syrup, Ghirardelli cocoa and organic milk and real whipping cream. It's delicious; we all love it! This comes as no surprise to the imbibers of good coffee in eastern Oregon, but it's pretty thrilling to think that wet side Oregonians might learn about culinary divinity from the east side. Very, very cool! I made a pot of tea and opened my mail, including the newest issue of Saveur magazine... guess what?!? There was yet another insert of the Oregon Bounty Wanderfeast map! I pinched myself and thought about how lucky we are in this beautiful part of the west. The new store is doing fabulously well in La Grande, the summer traffic in Baker City has been great and now we're lucky enough to be featured in the Oregon foodie marketing blitz! The most delicious part of our marvelous late summer 'bounty' was the discovery of a couple of new LOCAL garlic producers. Stop by either BELLA location in La Grande or Baker City to pick up the 8 variety assortment from Tuition Farms or grab a head or two of Sarah's gorgeous NE Farms Organic Garlic. yesterday Clay Andrew stopped by the La Grande store with a very serious look on his face. He asked if I remembered the rather stern words I'd had concerning a major glossy wine publication last week. I laughed out loud... can you believe this??? Clay sat down last to read his latest Wine Spectator and found the Oregon Bounty Wanderfest map featuring BELLA inside. I'm still chuckling over the luck! 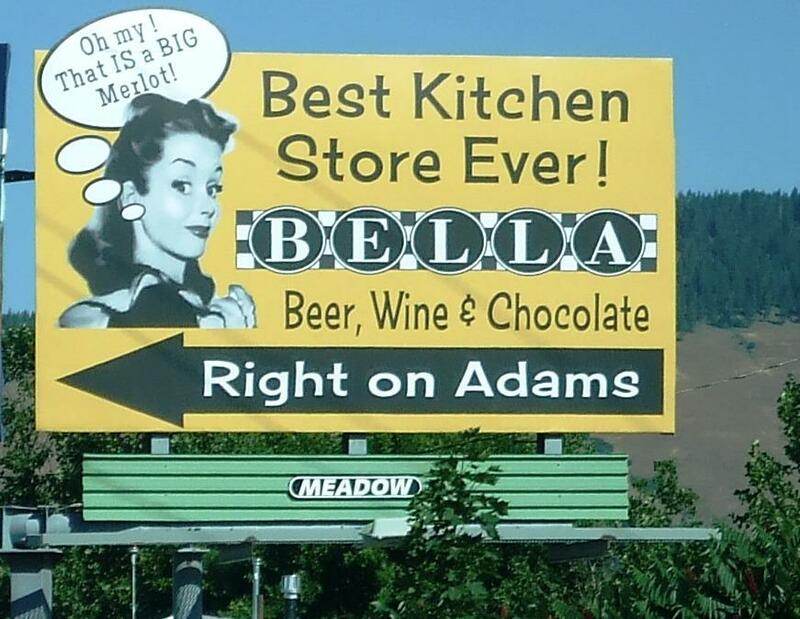 Stop into BELLA Main Street Market in Baker City - tell us if you've found the Bounty map in any other publications (will it be in Field & Stream?) and if you mention the BELLA Blog- the Cafe' BELLA is on us!